I have been using the cloud storage and file synchronization service Dropbox more frequently lately, and its is pretty awesome. You probably know that Dropbox keeps track of all file changes automatically, with options to restore a previous version of the file. While looking at that I noticed that it is possible to restore deleted files as well. I first thought about writing an article about that as it is a pretty interesting feature. Especially so for users who have accidentally deleted files, and users who want to make sure that deleted files cannot be recovered. A recoverable copy on the Dropbox server is the last thing those users would want. While I was investigating the issue I noticed that Dropbox subtracts the file size of deleted files from the available ratio. This basically means that you get additional upload space even though the files are still stored on Dropbox. Remember, deleted files do not get deleted right away. The Dropbox FAQ states that deleted files and old file versions get saved for 30 days by the service before they are removed. I also tested if it is possible to restore deleted files to get beyond the allowed quota of an account. Turned out that this is actually possible as well. Here is how it is done in detail. Go to the Dropbox website and log into your account there. Switch over to Files to see all your files currently stored on Dropbox. Activate the show deleted files button to display deleted files and folders in the file listing. These are highlighted in grey, and the size says deleted instead of the real file size. The idea is this. You upload files as usually to Dropbox. Once you come near the quote you start deleting files. Don’t worry, the files are still there. Your quote drops again and you can upload more files to Dropbox. I’m not sure if there is a limit or if you could theoretically go on forever. You can later on restore deleted files which can move you over your Dropbox quote. You basically have two options to go upload more files to Dropbox than your quote allows. Please note that deleted files won’t be synchronized, and that no new file versions will be saved by Dropbox. 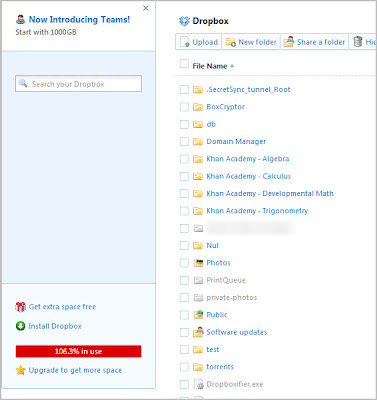 Have other Dropbox tips to share? Let me know in the comments.